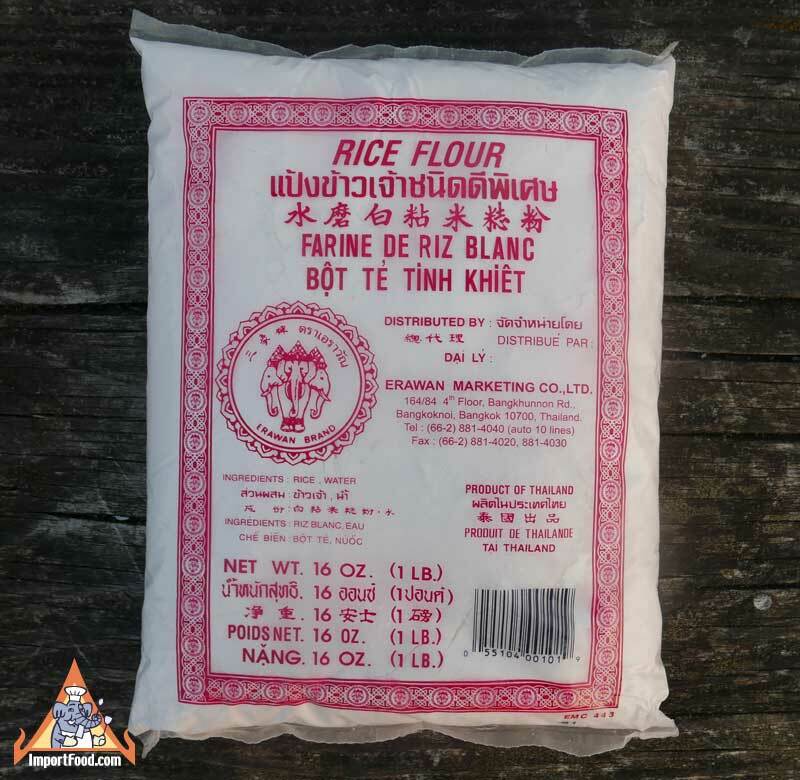 Rice flour, sometimes called rice powder, is made from finely milled white raw rice and is used to make fresh rice noodles, pastries and sweets. Rice flour is a staple food item throughout Southeast Asia. Used to thicken various Asian dishes. Below are several delcious recipes in our recipe section that use rice flour, and you must try Khanom Krok which our favorite. The general purpose of rice flour is similar to flour, and it's very fine like powder (finer than wheat flour). In particular, it's an important ingredient in various desserts. 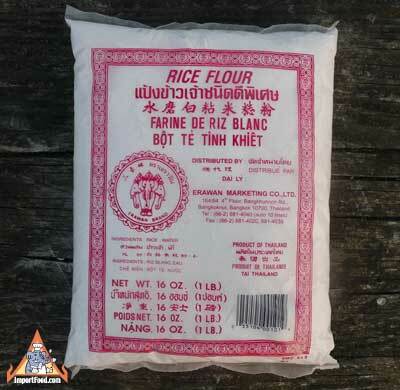 We also offer glutinous rice flour. Corn is a staple used widely throughout Thailand, whether it's sold by streetside vendors that cook it on a charcoal grille, added to ice cream (really!) or spooned onto pizza. Here's an enjoyable fried corn snack, which would most likely be served with a sweet chile sauce for dipping. A nice party snack, or quick lunch. This is a vegetarian recipe. Typically they will use rice that was harvested that day (still wet, and slightly green) but we use regular sticky rice here with good results. Kratong Tong is a non-spicy Thai appetizer dish that we enjoyed making as much as we loved eating it. Kids love these snacks, and they're perfect for the holidays. The kratong tong mold, shown below (and available from ImportFood.com) works perfectly to create unique little cups. It took some practice to get the recipe and method down, so enjoy this recipe and rest assured if you follow along it will turn out well. Hoi Tod is typically a small dish and it's enjoyed all day long. Mussels are common in Thailand and served in a variety of dishes, often on pizza among the various pizza chains. Here we show our recipe for hoi tod, and scroll lower left to watch our sidewalk chef video filmed in Bangkok. NEW: We offer a large hoi tod pan (flat wok). When chicken is fried this way, it comes out dry rather than greasy. The secret is to cook the chicken two times--first at low heat, then again at high heat. This kind of fried chicken is so tasty when served with sweet chilli sauce. The coating is fragrant and delicious, and it's called 'Hat Yai' which is a province in Southern Thailand. If you like fried chicken, give this Thai-style version a try. Thai Coconut Pudding, "Khanom Krok"
Golden Thai Pastry Cups, "Kratong Tong"
Thai Chicken Fried Hat Yai Style, "Gai Tod Hatyai"
Fried Thai Peanut Cookie, "Tua Tod"
Chicken in Pandan Leaves, "Gai Hoh Bai Toey"
Drunkard's Noodles and Chicken with Tofu, "Gai Pad Ki Mao"
Thai Sweet And Sour Fish, "Kraphong Khao Priao Wan"
Thai Noodle Soup With Pork, "Yam Wunsen Sai Mu"
Thai Red Pork With Rice, "Khao Mu Daeng"
Fried mung bean flour balls with tamarind/garlic sauce, "Bayia"